To Basque…or Not to Basque? Athletic Bilbao is famous among football circles for being one of the only clubs in the world that insists on signing only local players to their team. Athletic was formed in 1898 in Lamiako (now part of the town/municipality of Leioa, about eight kilometers north of Bilbao), Bizkaia by British industrial workers living in the area. Athletic is also the oldest football club currently in the Spanish First Division, being one year older than FC Barcelona, and being the only club, aside from FC Barcelona and Real Madrid, to have never spent a season in Second Division. It is a club with a cult of personality; in Bilbao, it is very difficult to support any club other than Athletic, as Bilbao has no other major professional side, and no one would dare support Real Sociedad, based in San Sebastián (or, as the Basques call it, “Donosti”, short for Donostia, the Basque name for the city), Bilbao’s major rival. Athletic is the one thing residents of Bilbao, in fact all of Bizkaia –Vizcaya in Spanish–, have in common. One question that always seems to be asked of this seemingly small club is why it only signs Basque players. Another is how. With the why, it’s a national pride issue. Aside from the first squad in 1898 where more than half of the starters were of English nationality, Athletic has prided itself on never signing a “foreign” player to its club. And by foreign, of course, I mean non-Basque. This is an interesting concept because, despite (or, as some fans would argue because of) this little caveat, Athletic has been one of the Spanish league’s most successful sides. As I mentioned earlier, Athletic is one of three clubs that has never dropped to second division, though they have come extremely close a few times. But what exactly is a Basque? Or at least, what constitutes a Basque as far as Athletic Bilbao signing their football talent is concerned? The Basque Country, or at least as it’s defined by Spain –where it’s called País Vasco–, where most of its geography lies, is made up of three provinces: Bizkaia, Gipuzkoa, and Araba (Álava in Spanish). The Basques, however, also consider the province of Navarra as part of their ancestral homeland, as well as three tiny provinces in the southwestern corner of Aquitaine in France. 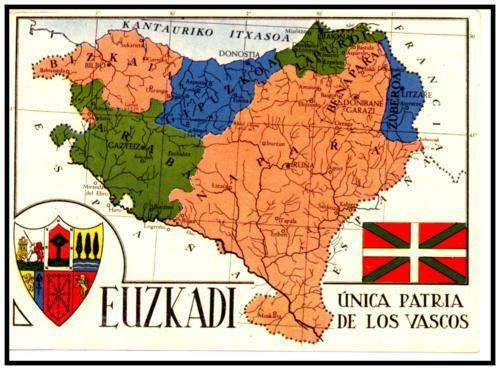 This is what to Basques is considered the “Basque Country”, or “Euskal Herria”: Land of the Basque-Speaking People. Where this comes into play for Athletic is that anyone who is “from” this small corner of the world –only about two million people live in Euskadi proper: that is Bizkaia, Gipuzkoa and Araba– can, essentially, play for the club. To illustrate how this works, I want to focus on two players currently playing for Athletic: Fernando Amorebieta and Fernando Llorente. Just tonight, in a World Cup qualifying match against Argentina for the 2014 event, Amorebieta scored a goal for Venezuela, the only goal of the match giving the Venezuelans the victory. Now, some of you are probably asking how this is possible, if I just explained that only Basque players can play for Athletic; and how can a player play for Venezuela if he’s Basque…or for Athletic if he’s from Venezuela. Here’s the story with Amorebieta. He was born in Venezuela in 1985. His parents, however, were Basque, from a small town in Bizkaia called Iurreta. They were in the Americas on business, and while in Venezuela, Fernando was born. When he was two, the family moved back to Iurreta, and it would be another twenty years before Fernando returned to the country where he was born. What makes Amorebieta able to play for Athletic is the fact that, despite being born in Venezuela, he comes from Basque parents and a Basque family, and he essentially grew up in the Basque Country. Thus, Athletic had no issues with signing him in 1996 to play in the youth system despite not having been born in Spain. And I would argue, despite not knowing Amorebieta personally, that he would consider himself Basque. Fernando Llorente has a nearly parallel, yet opposit, story. Llorente was born in Pamplona (also in ‘85) –Iruña in Basque–, the capital of Navarra, one of the historic Basque provinces. His aunt was working as a nurse in a hospital there, so Llorente’s mother drove from the town of Rincón de Soto in La Rioja (a province just south of Araba and just west of Navarra) to Pamplona to give birth. La Rioja is not technically a Basque province at all, and Llorente grew up in this small town in a non-Basque province. However, since he was born in the Basque Country, he is considered a Basque and has in fact played in friendlies for the Euskal Selekzioa –the Basque national team– in some of their exhibition friendlies. Llorente himself, however, has mentioned in interviews that he considers himself “Riojano” and makes no mention of being Basque at all. These two players, both beloved at Athletic –Amorebieta has turned down offers from various EPL clubs, as well as Rubin Kazan recently. Llorente is called “El Rey León”, because of his thick, lion-like hair and the fact that Athletic’s mascot is the lion–, thus illustrate how Athletic’s seemingly tough policy actually works. Therefore, in order to play for Athletic, you have to either have Basque parents or be born in the Basque Country. These are the reasons used to sign players by the club, one of the greatest in Spanish football history, and one of the reasons they are able to keep themselves afloat. There are some Athletic supporters who feel that the conditions for “Basqueness” at the club are far too lax, others say they are too strong and that the club could do with some “new blood”; though it can be argued that those who say this are not true fans. Either way, it is true that as far as the coaching is concerned, anything goes; Athletic’s current coach, Marcelo Bielsa, is Argentinian.